Hey! 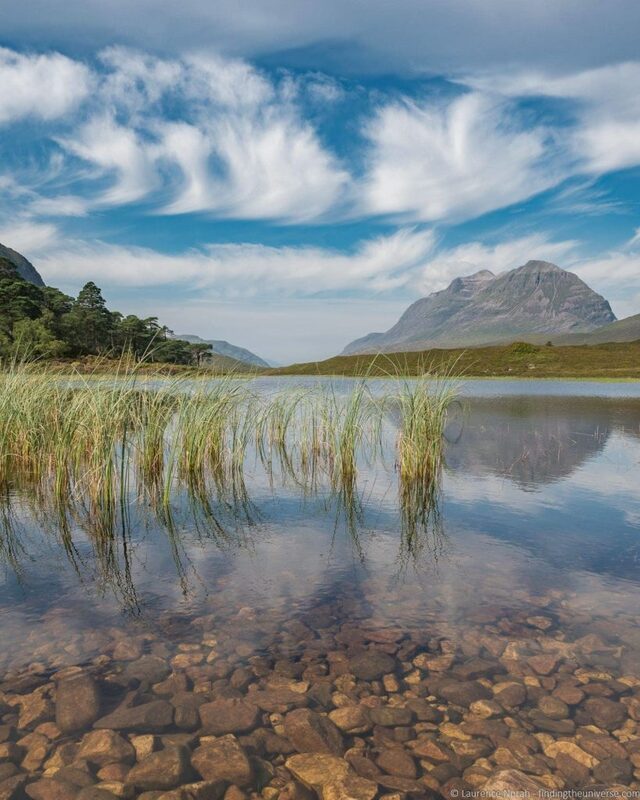 Have you heard of the North Coast 500? 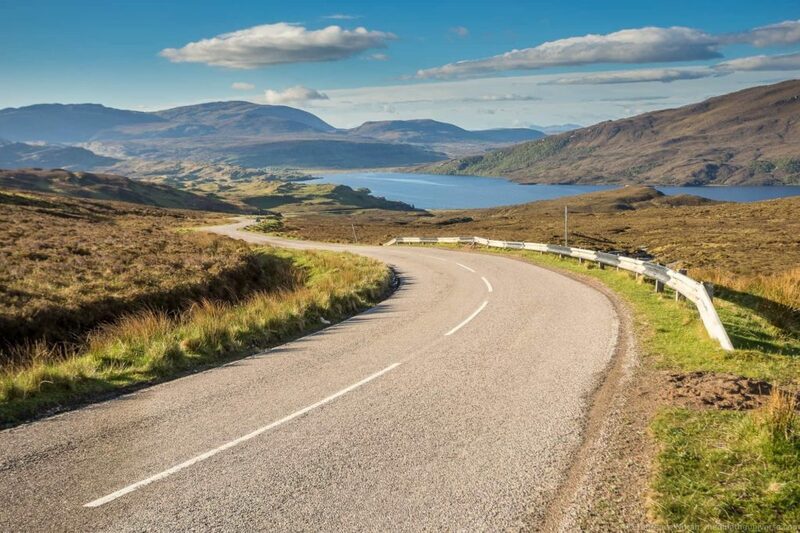 Well, if not, it’s an epic scenic drive around the northern coast of Scotland, starting from Inverness in the north east of the country and heading all around the top of Scotland in a big loop that brings you back to Inverness. 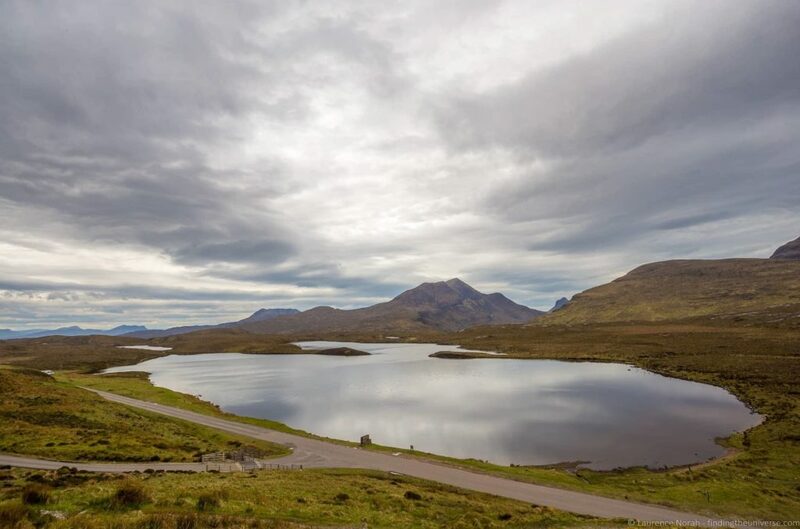 In those 500 miles of driving you’ll see some of the best scenery that the rugged Scottish north has to offer, from lochs to castles to highland landscapes. There’s delicious food, winding roads, white sandy beaches, whisky and gin distilleries, art galleries, cosy B&B’s – basically, everything you can think of. We’ve had the pleasure of experiencing the North Coast 500 and had an absolute blast doing so, covering the 500 miles of the journey in about a week. And we’ve got lots of content from our adventure to help you plan your own! This post shares an overview of some of my favourite photography locations along the route. There are hundreds of gorgeous photography spots to sate every photographer, and you’re going to find yourself stopping a great deal to grab photos as you tackle the North Coast 500, but these were definitely some of my favourites amongst the many great stops we had. These are in order as you leave Inverness on a counter-clockwise route. 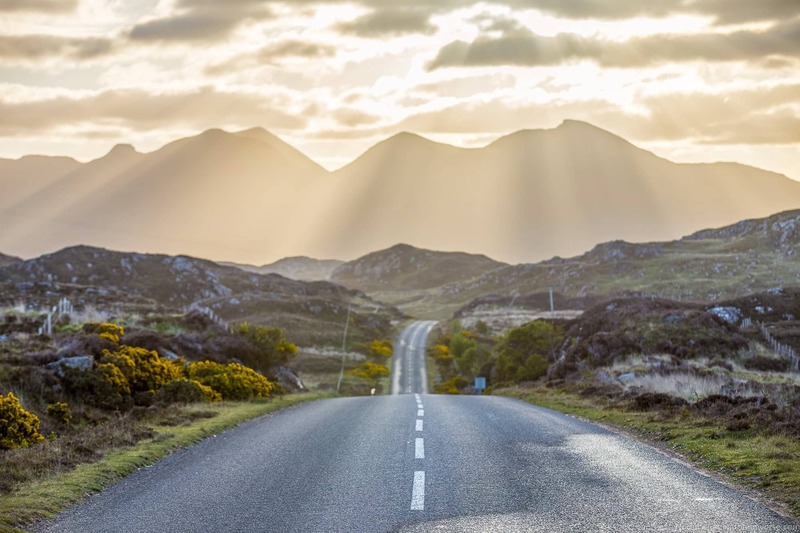 As well as this photography guide to the NC500, we’ve also written a guide to the highlights of the NC500, a 7 day North Coast 500 camping itinerary, 14 reasons to drive the North Coast 500 and a detailed guide to accommodation on the North Coast 500. Jess has also put together the definitive guide to planning a North Coast 500 trip. Now, let’s get started with my idea of the best spots to take a photo on the NC500. 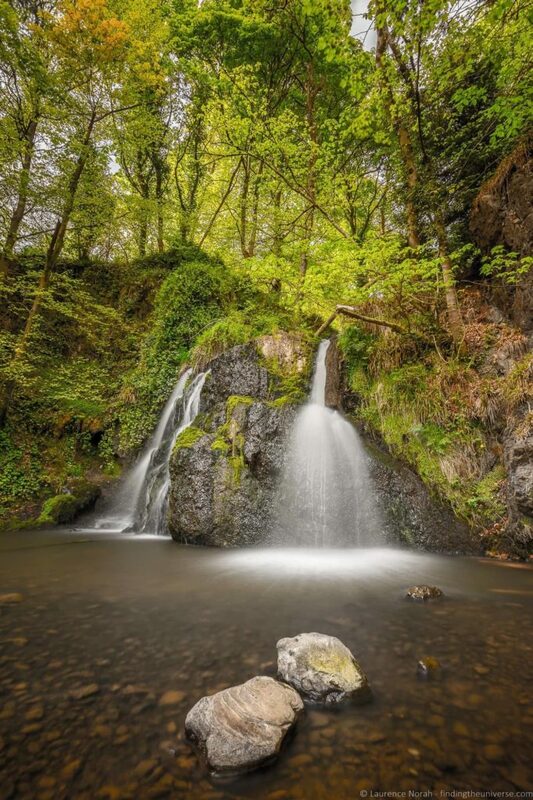 After leaving Inverness we’re going to start our adventure with a beautiful waterfall at the wonderfully named Fairy Glen, a couple of minutes drive north of the town of Rosemarkie, found on the Black Isle Peninsula. As you can see, this waterfall is well worth the thirty minute round trip hike. There are actually two falls here, with my favourite being the top falls, which is the one pictured. You’re going to want to bring a tripod (I use and recommend the Vanguard VEO range for travel!) and a set of neutral density filters to achieve the fluffy water look in this shot! I’d also recommend taking some time to explore the village of Rosemarkie, which has a lovely beach and interesting museum about Pictish standing stones. Nearby at Chanonry Point there’s also a popular dolphin watching spot – if you come here when the tide is rushing in, there is a good chance you’ll see dolphins feeding on the salmon as they head upstream. 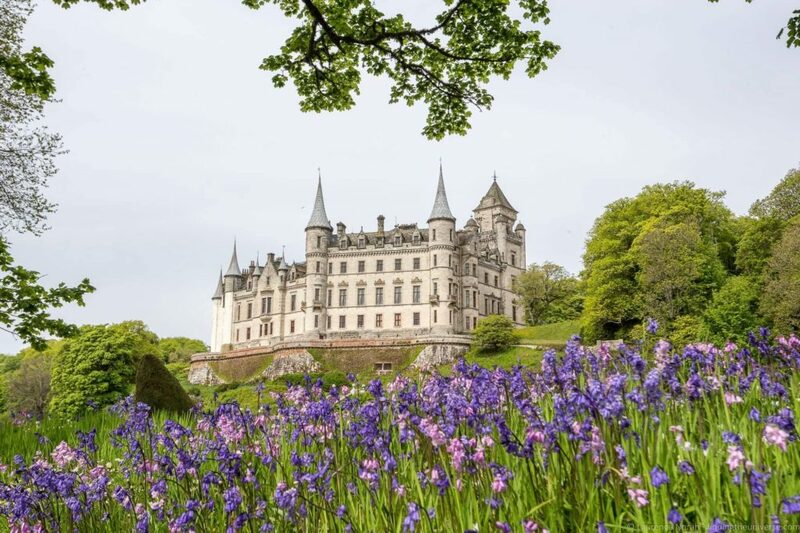 Continuing up the east coast of Scotland, the next stop is a magnificent fairy-tale style castle with wonderful grounds – Dunrobin Castle. The castle can be toured on the inside (but photography is not permitted inside sadly), and whilst I would recommend taking the tour (and visiting the fascinating old-world style museum on the grounds! ), in my opinion, the best shots of the castle are to be had from the grounds. When we visited I was delighted to find a patch of bluebells, which let me get a shot with the castle and the bluebells framed wonderfully by some of the trees on the site. There’s also a huge staircase leading up to the castle from the garden which makes for some good photography opportunities. 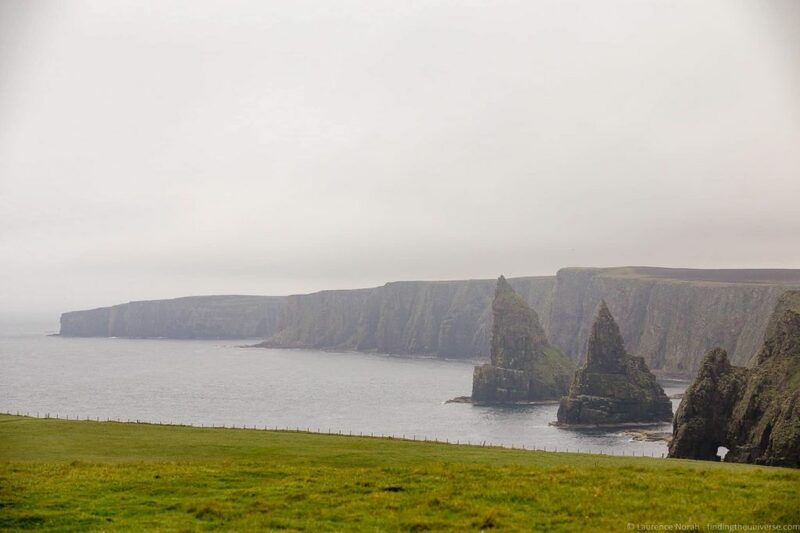 Heading right up to the far northern tip of Scotland now, near the town of John O’Groats, you’ll find Duncansby Head – the most north-easterly point of Scotland. Here there are some huge sea stacks visible within ten minute walk from the parking lot, offering a wonderful photography opportunity. It is also a very popular wildlife viewing area for whales and seabirds. Admittedly, the weather wasn’t exactly co-operative when we visited (the Scottish weather is notoriously fickle throughout the year), but it made for some dramatic scenery. After all, blue skies the whole time would be kind of boring. And unbelievable, in Scotland. As well as the views of the sea stacks at Ducansby head, this area is notable for a few things that might interest photographers. From the car park, you can see both migrating whales and also nesting puffins, depending on the time of year. The town of John O’Groats is famous in the UK for being the most northern point in the UK, although that title is actually slightly misleading – the nearby location of Dunnet Head is in fact the most northerly point on the island. 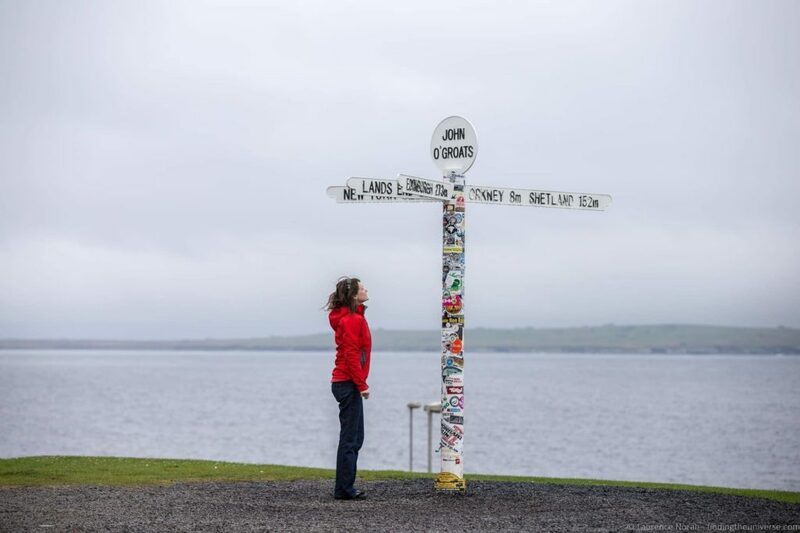 Instead, John O’Groats is the town which is the furthest away from another inhabited part of the UK – Lands End in Cornwall. Despite the misinformation about the location, there is a great sign that just about everyone takes a photo of in John O’Groats, so you should do that. It is also a popular food and shopping stop. Time for some lochs, the Scottish word for lake. As you drive along the northern coast, you’ll come to the town of Tongue. Here, the North Coast 500 crosses over a bridge across the Kyle of Tongue (a sea inlet), but you can take a slightly longer route around the Kyle, on a small country road that passes between two small lochs – Lochan na Culice and Lochan Hakel. 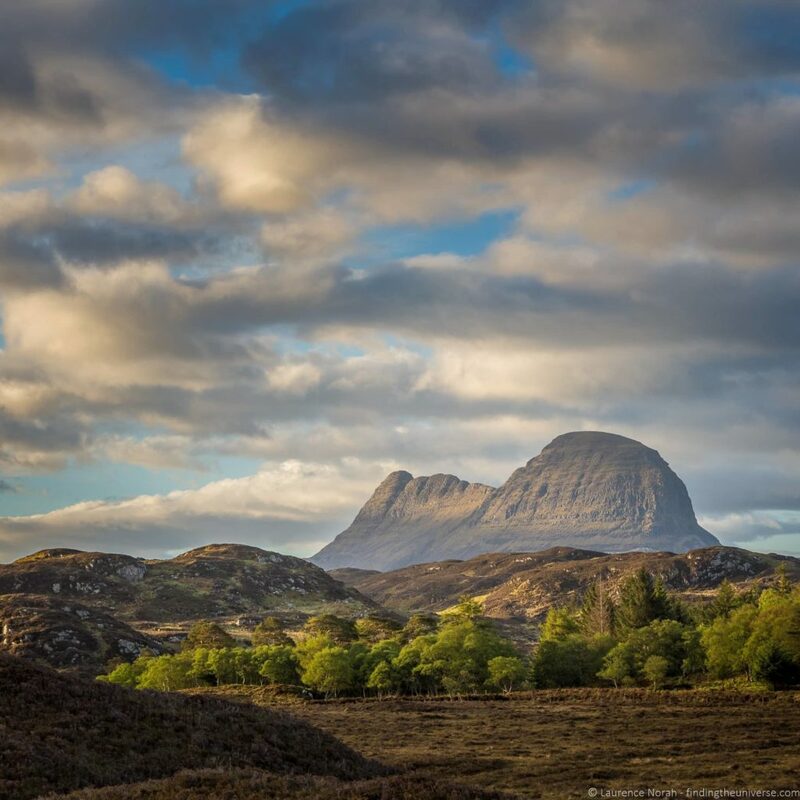 From here, as you can see, there are some lovely views across to Ben Loyal, a 764m high mountain peak consisting of four rocky peaks. You’ll also see that I took this shot in the pouring rain – yay for the Scottish weather! Parking is a bit limited here although there are some spots to pull off the road around here. Also, be aware that the track to the loch can be muddy, so good shoes or hiking boots are essential! We passed through here in the middle of the day, but it would make for an excellent sunrise or sunset location. Continuing along the northern coast of the North Coast 500 route, and you come to a lovely stretch of white sandy beaches and coves, many of which are truly photogenic. 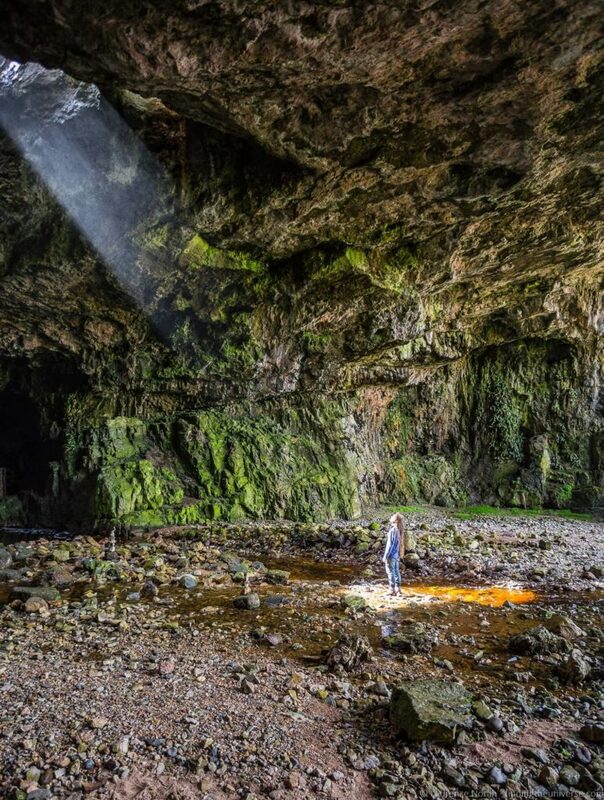 I’m going to suggest though that the photography highlight of this area is the wonderful Smoo Cave. This massive cave, which is a combination sea and freshwater cave, is carved out of limestone and features a waterfall inside the cave. Which is pretty neat. There’s also a hole over the main cave entrance through which the light enters, and if you happen to time it just right like we did, you can get a funky beam of light effect. Which naturally I had to stand in for a Star Trek transporter effect. For best results shooting inside a cave you’re likely going to need a tripod as, well, caves tend to be quite dark places. Shooting out of the mouth of the cave is also a high contrast scene, so you might find that shooting a sequence of exposure bracketed shots and then blending them together to create a high dynamic range image will give you a more realistic effect. 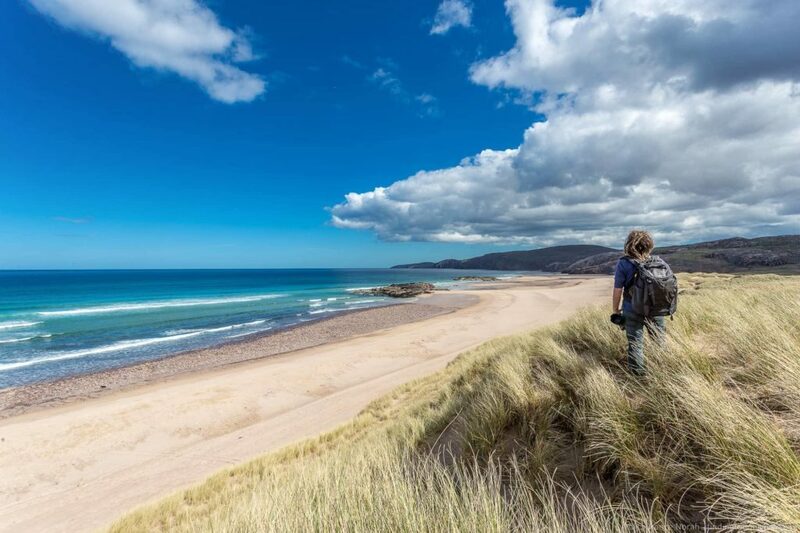 Often voted as one of the most beautiful beaches in Britain, Sandwood Bay requires a bit of an effort to get to in the form of a moderate eight mile round trip hike. The effort is very much worth it though, as you’ll likely find the beach virtually deserted. And what a beach it is! With big grass covered dunes, white sands, and even a huge sea stack against a backdrop of towering cliffs, there’s plenty here to take photographs of. This would be fantastic for either sunrise or sunset, although this would require a bit of hiking in the dark or some wilderness camping. On our trip we sadly didn’t have the time for that, but it was still beautiful to visit in the daytime as you can see. Time for another beautiful Scottish waterfall! This one is on the west coast of Scotland, just near the town of Clashnessie and Clashnessie Bay, which is where the water from the falls enters the sea. 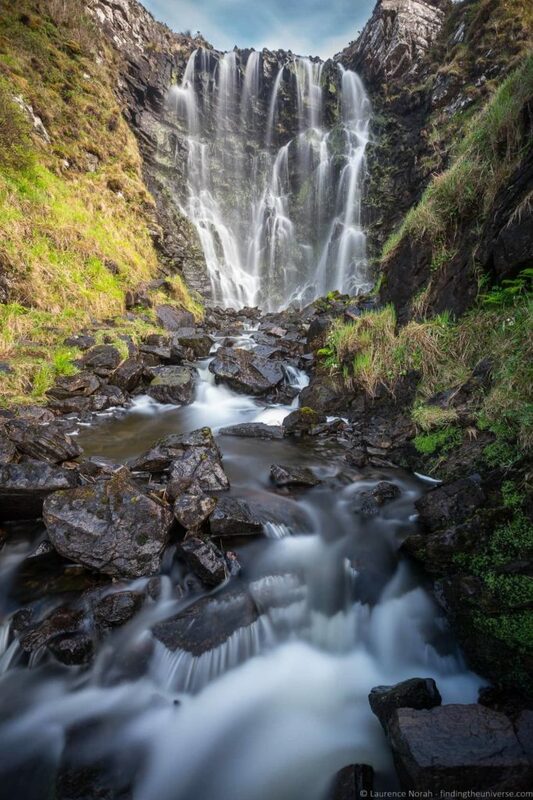 The falls themselves are very picturesque at around 15 metres high. Access to the falls requires you to park somewhere in the town, and then walk along the signposted route which can be found around here. It’s about a 15 minute walk each way and the trail can be very boggy, especially as you get closer to the falls, so good hiking boots or boots are essential. When we visited there had been some rain and the falls were in good flow, plus there was no-one else around, so I was able to get some lovely shots. Definitely bring a tripod for this shoot and take your time, as the area around the falls can be quite wet and slippery. Just a little way south of Clashnessie is the magnificent Achmelvich Bay. If you want to photograph a wonderful white sandy beach but don’t feel like the hike out to Sandwood, the bay at Achmelvich is the place to head. It’s a very short walk from the car park over the dunes to the bay, with another cove just over the headland to north. 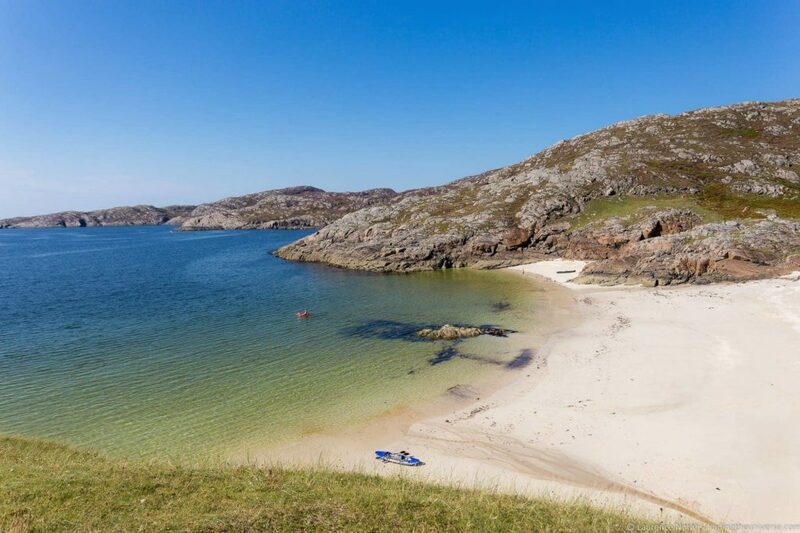 Achmelvich is certainly a busier option that Sandwood – there’s an on-site campsite so expect lots of other people to be about – but the bay is truly beautiful, and the turquoise waters and white sands will almost have you thinking that you’ve arrived on some far flung Caribbean island rather than a Scottish beach. If you’re particularly brave you could even take a swim in the sea, although despite it looking tropical, the water temperature will quickly remind you that you’re still in Scotland! As I’m sure you’re aware, the best times of day for photography are sunset and sunrise. When we travelled the North Coast 500, in late Spring, sunrise was at around 4am, and sunset was well after 9pm. Those lovely long days meant we got plenty of daylight for exploring, but it did make getting up early for sunrise a challenge. That’s not to say that I never made it up for sunrise. 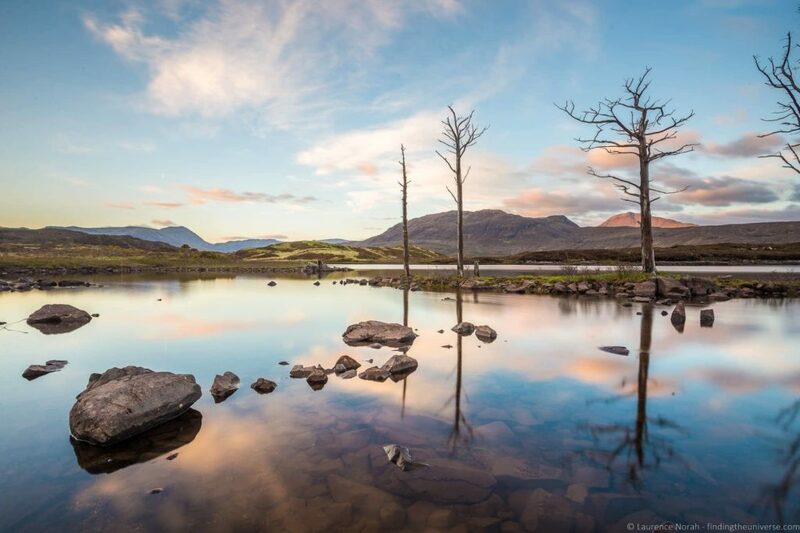 One location that I picked to shoot the sunrise was Loch Assynt, near Lochinver. 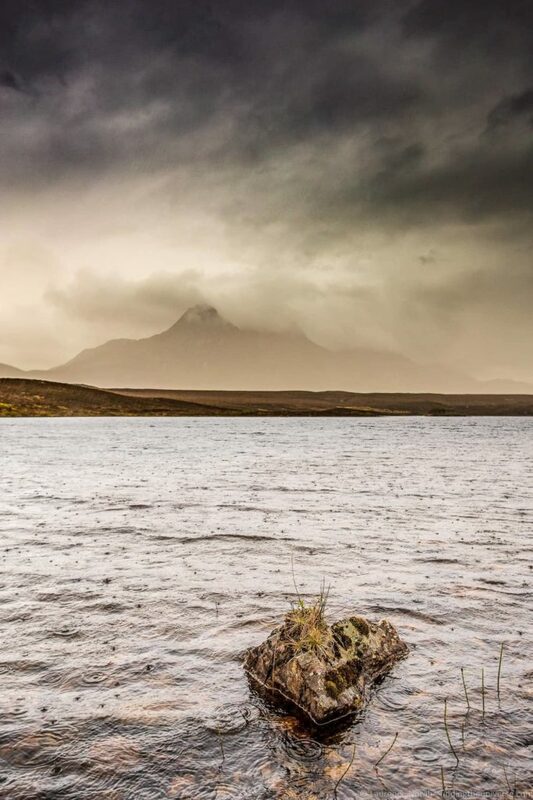 Here there are wonderful views of the loch surrounded by mountains, including the iconic Suilven mountain ridge, which should definitely be on your list to photograph. Coming out this early in the morning also means two things. You’re likely to have the world to yourself, giving you nice people-free scenery to shoot. You’ll also find a lot of wildlife out and about. I saw hundreds of deer wandering around with the golden dawn light illuminating them wonderfully. Definitely bring a nice long lens to grab shots of these chaps on the skyline! 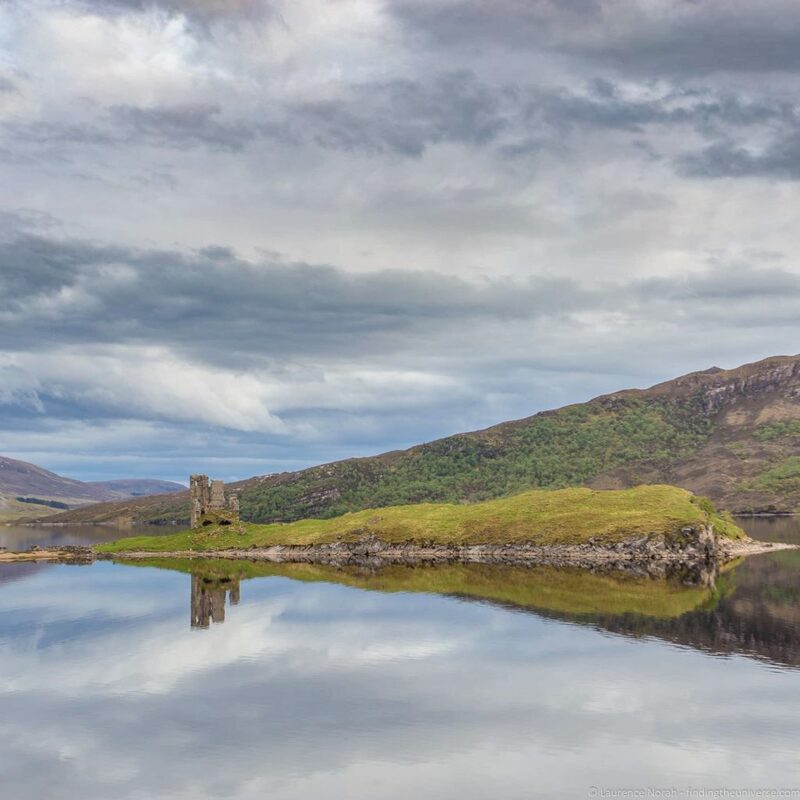 A little way further along Loch Assynt as you head east from Lochinver is the spectacular ruin of Ardvreck Castle, which is a “must photograph” location. Dating from the 16th century, this ruined castle sits on a promontory which juts out into the loch, and if there is enough water in the Loch it actually turns into an island. There are a number of locations from which you can shoot this castle, my recommendation is to find a spot where you can see the castle reflected in the loch, and hope that you get a still day! You can also go onto the promontory where the castle is to get some different angles and backdrops, plus ensure you get the light in the best angle for your shot. As always though, you’ll want to try and make it here for sunset or sunrise if you can for the best possible light. Heading a little south from Loch Assynt and the North Coast 500 passes by Knockan Crag, a National Nature Reserve which is notable for its outstanding geological features. From the car park and hillside here there are spectacular views across the Scottish highlands, including the twin summited mountain of Cul Mor and a number of lochs. It’s also a nice place to get above the road and get some shots of the North Coast 500 itself. When we visited here we were lucky enough to see a supercar club drive past, with millions of pounds worth of Aston Martins, Corvettes, Ferraris, and Lamborghinis, amongst others, roar on by. Also up here are a number of art installations and information panels explaining the geology and interest of this area. The globe shaped art installation is particularly photogenic, so don’t miss that as you wander along the path! 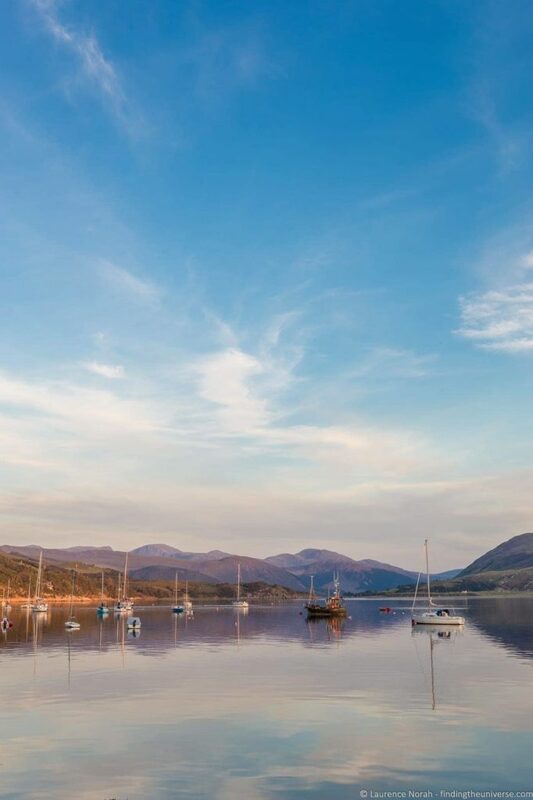 On your North Coast 500 drive it’s very likely that you’re going to stop over and spend the night in or near Ullapool, which is one of the larger towns in this area. With a beautiful harbour location, it’s a great spot for photography. I particularly enjoyed watching the sunset across the harbour at Ullapool, with the still waters reflecting the sunset light. There are a number of locations here though, including some spots above the town that are worth getting to so you can shoot down across the town with the harbour and mountains in the background. Then, stop in somewhere like The Arch Inn in for a pint and bite to eat! I couldn’t do a photo roundup of the best photography locations on the NC500 without including the iconic Highland Cow, or Coo. 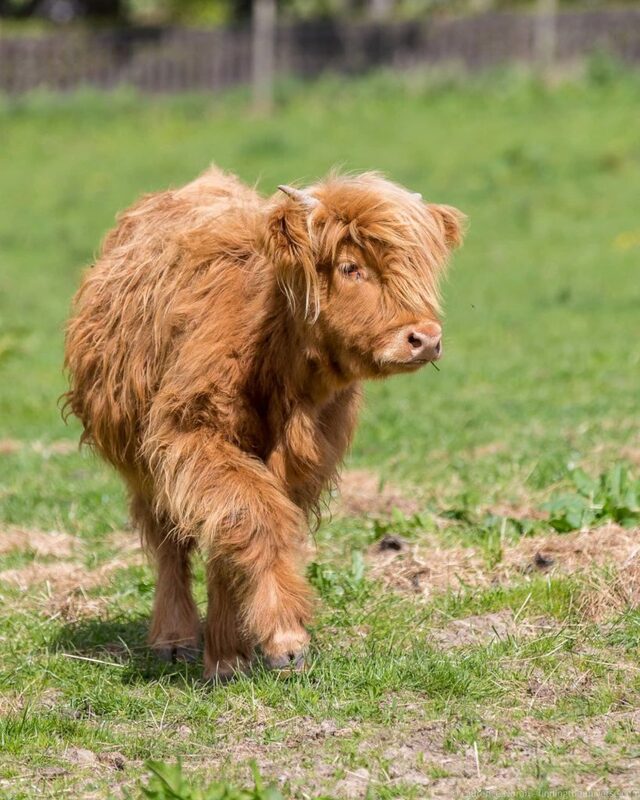 These wonderfully hairy animals are fantastically photogenic, and definitely worth stopping to take a photo of if you happen to encounter them along your drive. 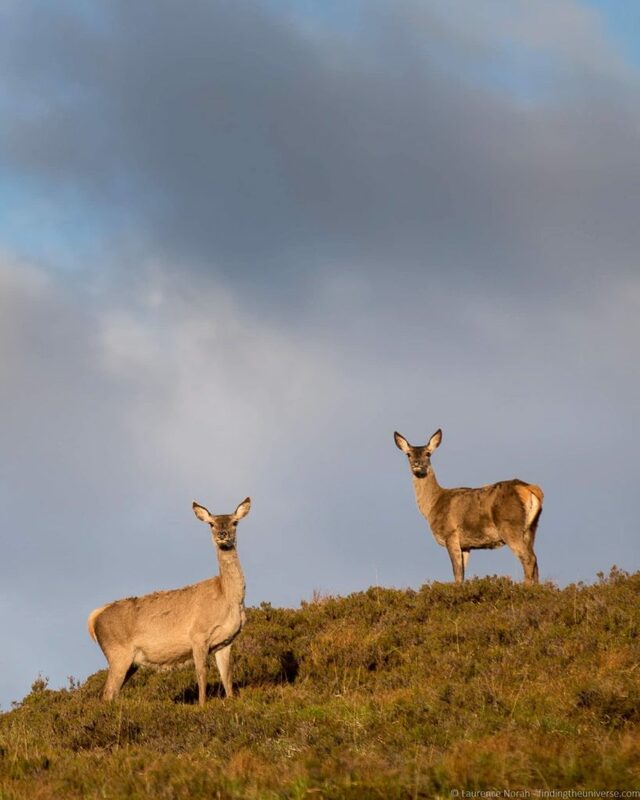 If you don’t happen to come across them on your trip around the NC500 though, don’t worry, there are a few locations where you are almost guaranteed a photo of these guys. These are Robertsons Larder and Farm Shop, just north of Inverness, Braemore Square Country House just south of Ullapool, and the Torridon Hotel near Torridon. 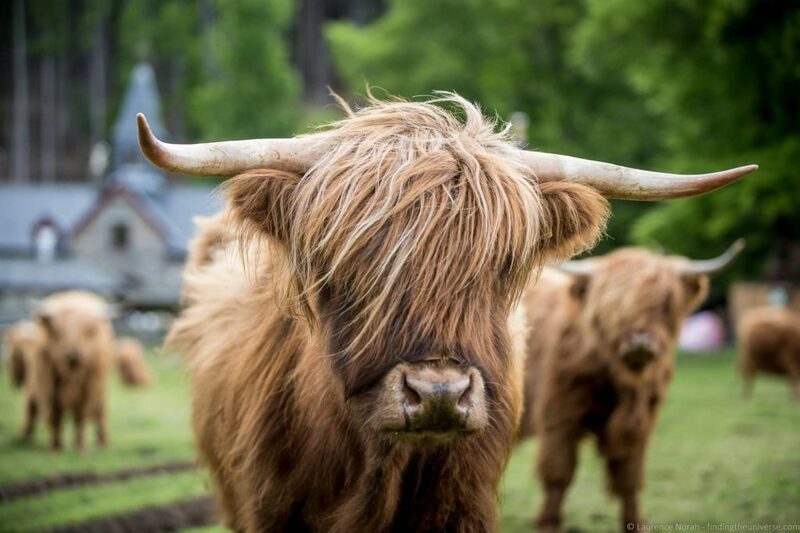 All of these locations have highland coos on their property, although as Braemore Square & the Torridon Hotel are hotels and private property we’d suggest that you should look to spend the night here if you want to meet the coos, as we did. Both have fairly large herds of cows, which affords plenty of opportunities to get some lovely shots. Both properties are also very nice and we highly recommend staying the night here. The Robertsons Larder and Farm shop have a pair of cows, one older and one younger. You are welcome to stop here just to take photos, although we’d definitely recommend checking out the farm shop. We stocked up for a picnic here on local cheeses, meats, relishes and biscuits, and had ourselves a real feast. We also took a lot of photos of their friendly coos! When we visited Mellon Udrigle Bay the weather was very much against us, with moody grey skies and rain threatening to drench us. Still, the weather is all a part of the wonder of Scotland, and you’ve definitely got to embrace it. Which we did, when shooting this lovely white sandy bay. This is an easy to access bay, although as it’s a little off the beaten track it shouldn’t be too busy – especially if it’s grey and rainy as it was when we visited! This was definitely one of my favourite locations to shoot when driving the North Coast 500. 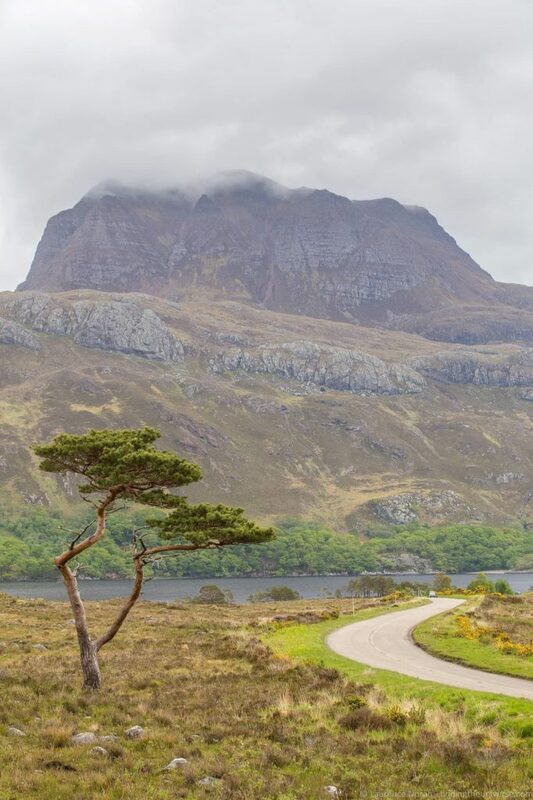 This lone pine tree sits by the road with Beinn Eighe towering behind it. There is a small parking place just by the bridge here, but it’s not very big (or signposted), so if you blink you’ll miss it. The pine tree itself is just about here, with the parking spot a little to the east where the river is on the map (it’s on the south side of the road). I thought this was a wonderful spot to capture the majesty of the Scottish wilderness alongside the winding road of the North Coast 500. As the North Coast 500 starts to wind around the Applecross Peninsula there are a number of fantastic locations to shoot the scenery. I had two favourite spots on this route, one a little outcrop in the western part of Loch Clair, and one that offered some great shots of the road which at this point is just single track. The first of these locations, shown above, can be accessed down a small track by pulling over at the cattle grid here. 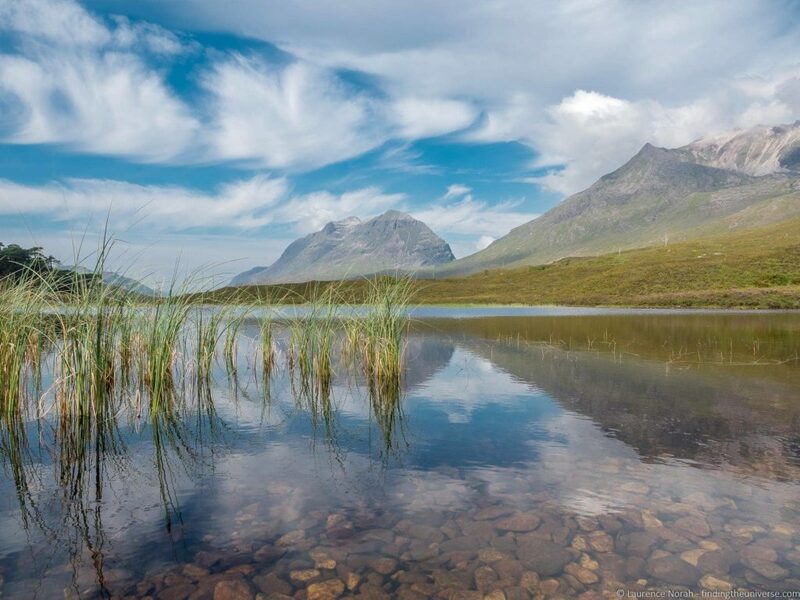 If you’re lucky enough to have a good, still day, you can get a fantastic shot of the hills and mountains reflected in the Loch, with some nice foreground reeds to help in the composition. If you’d prefer to just shoot the road itself, I got the above shot a little further along the A896 in the direction of Torridon, specifically around here, looking to the west. I loved how the road winds off into the distance, the dramatic clouds and the mountain Ben Eighe in the distance. 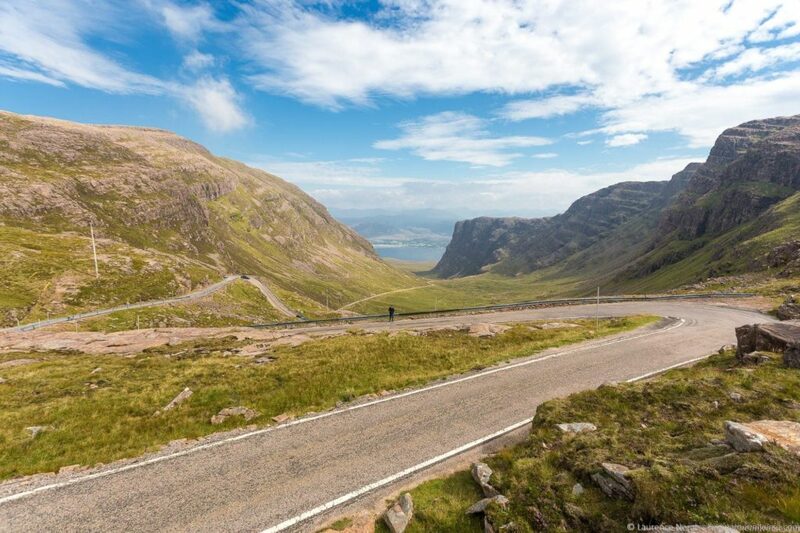 One of the driving highlights of the North Coast 500 is the infamous winding mountain pass road known as the Bealach na Bà, which means Pass of the Cattle in Gaelic. This road features numerous hairpin bends that climb up the greatest ascent of any road in the UK, with an ascent from sea level to 626 metres. It’s the third highest road in Scotland, and quite a drive! 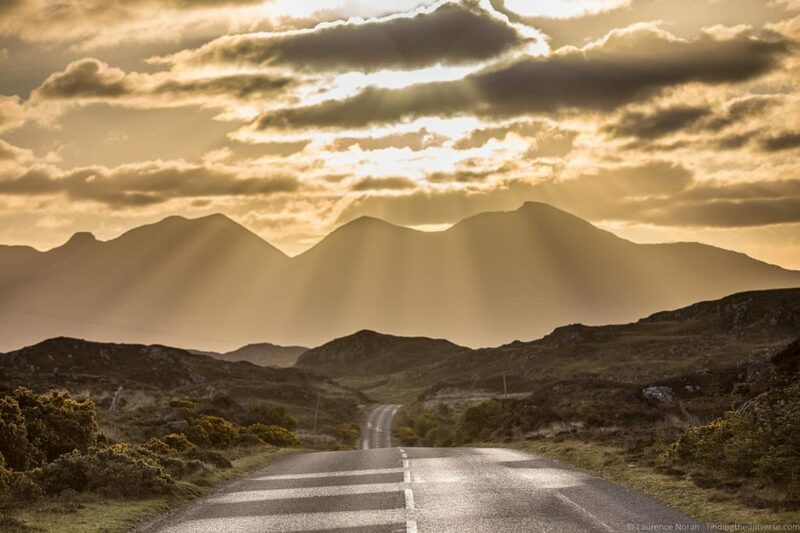 From the top, you get excellent views back down the curving road itself, plus if you look in the opposite direction on a clear day you’ll get wonderful views of the Isle of Skye – another photographic paradise! This is somewhere you’re going to want a super-wide lens to get as much of the road in as possible. I was shooting at 17mm on a full frame camera and still couldn’t quite get it all in – a fisheye might be best here! 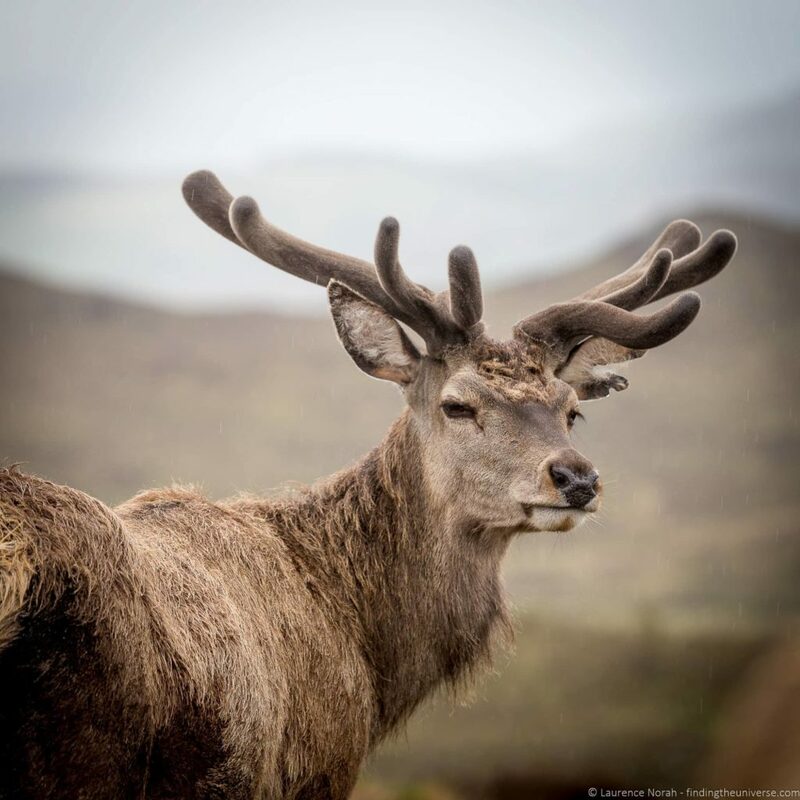 The other animal in Scotland that you’re likely going to want to take a photograph of are the Scottish deer – and ideally a stag with those magnificent antlers. Of course, you’ll have to visit in the right part of the year, when they actually have antlers, if that’s the shot you’re after. You will likely see a number of deer on your travels, but you can maximise your chances of getting a great shot in a few ways. First, getting up around sunrise will definitely help, as more wildlife will be out. I saw hundreds of deer when I was out and about at 4am for first light, and they seemed rather perplexed to see me, meaning I was able to get some great shots before they figured out they should probably be running away. Another way to get really close up shots is to take a tour with Colin Murdoch in Reraig Forest. Colin is an expert deerstalker who manages a herd of deer in this forest, and he’ll take you to meet his beautiful deer. They’ll get within touching distance, affording you plenty of photography opportunities, so if it’s deer photos you want, this is definitely the place to come. For wildlife photography, you’ll want a long, fast lens. I shot these with a 70-200 f/2.8 lens, letting me fill the frame with the deer. Last, but not least, please don’t take this as the definitive list of photography locations on the North Coast 500! One of the wonders of driving this road is making your own discoveries, and you’re going to come across so many beautiful locations, from castles to mountains to waterfalls and lochs! So take your time, pull over often, and give your camera a good workout. You’re going to capture some fantastic images on this journey! Having covered some of my favourite photography locations on the North Coast 500, here are a few tips to help you get the best shots as you go. Scottish weather is best described as fickle. You can have glorious weather in January, and torrential rain in August. It can also change on a dime, and predicting what it’s going to be like for your visit is going to be really challenging. So my advice is just to prepare yourself for all eventualities. If the weather isn’t blue skies and white fluffy clouds, just go with it. 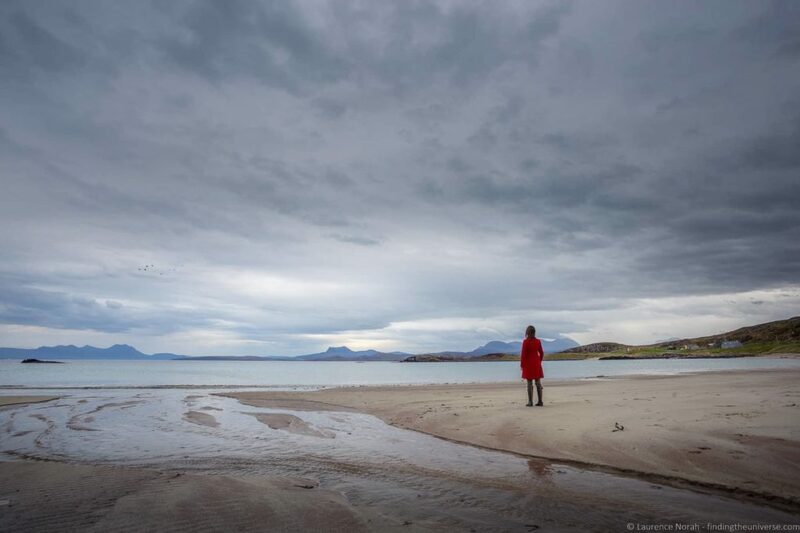 Get your warm jacket and rain gear ready, and shoot some moody Scottish landscapes. A highland scene draped in misty fog can be a wonderfully dramatic shot, so do your best to capture the moment – whatever the weather. Of course, the right photography gear will vary depending on what you like to shoot. My advice for the North Coast 500 is to pack for landscape and wildlife photography, which I would suggest would involve a wide angle lens and a zoom lens if you’re shooting with a camera that supports interchangeable lenses. I’d also suggest picking up a set of neutral density filters and a tripod. If you’re using a compact camera, then I’d advise buying up a model that has a good zoom range, so you can shoot both landscapes and far away objects like deer or cows. If you’re interested in what we pack for our travel photography, this post goes through our travel photography gear, while this post has advice on picking a travel camera. Composition is a key part of photography. I wrote a whole post on composition, so I won’t go into it in detail here, but on the North Coast 500, my advice is to take advantage of the beautiful roads that wind through the highland scenery in your compositions. This will help draw your viewer into the scene, and if there’s a colourful car on the road it can help tell a story too. This is a journey that is very much about the road, so including it in some of your photos is definitely a good way to share your adventure with the people looking at the photos. Light is everything in photography, and the best light is to be found around sunset and sunrise – the so-called “blue” and “golden” hours. At these times of day you get the most beautiful light for photography, letting you capture magnificent colours and scenes. If you can, do try and capture a few sunrises on your trip, and plan your stops so you can be near something photogenic like a still loch or castle. 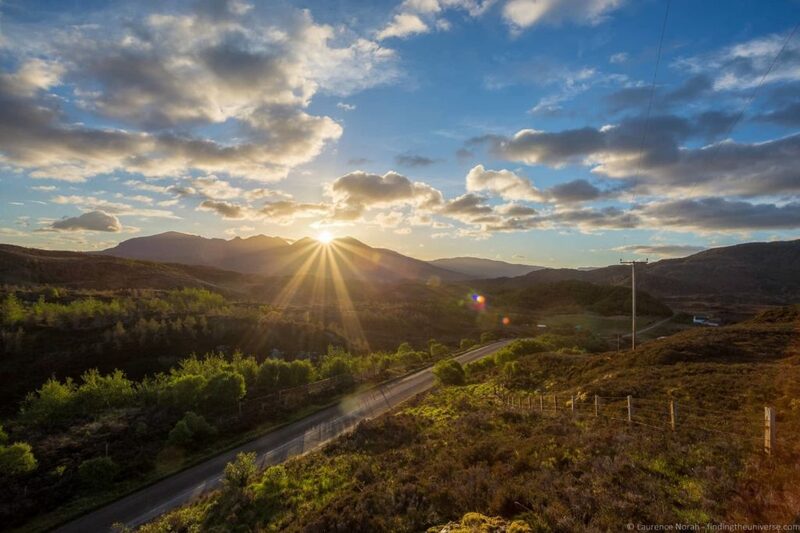 Sunset is obviously easier to catch, but be aware that it can often take place during meal times, so try and plan your meals so as not to miss the sunset if you want to get the best photos on your North Coast 500 journey. Whilst the easiest way to see all the photography highlights of the North Coast 500 is to drive yourself, we appreciate that not everyone will want to do this. You’ll still be able to get some great photos on a guided group tour, of which there are a few available. At the time of writing we are know of two group bus tours along the NC500. Our recommended tour is this 3-day tour from Inverness from Rabbie’s Travel, but there is also this 4 Day tour from Edinburgh. Well, that pretty much sums up some of our favourite photography locations on the North Coast 500! We’ve got a lot more content to share with you from our trip to help you plan your perfect North Coast 500 trip, but in the meantime, here are some links to help you with your trip planning. I’ve also put together a detailed guide to all the highlights of the North Coast 500, to ensure you don’t miss anything on the route! 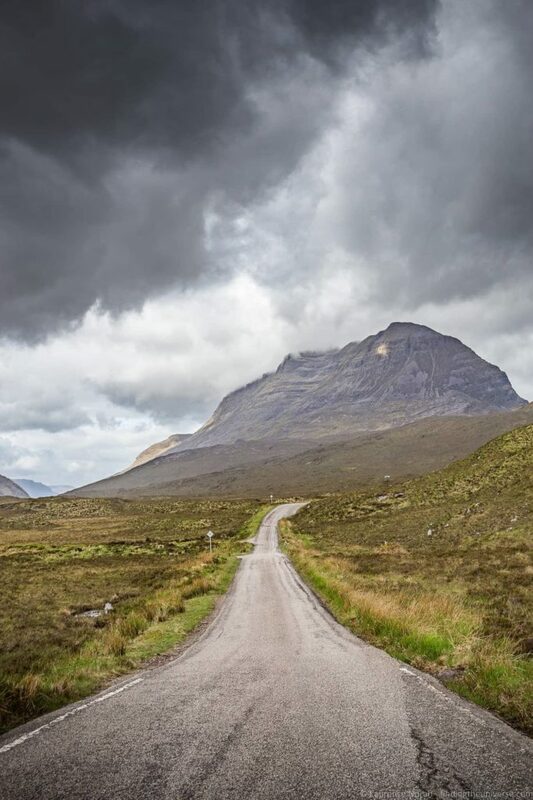 The North Coast 500 has a lot of single track roads – see our advice for how to drive on single tracks roads to help you prepare if you’re not familiar with these. The official website for the North Coast 500, which has maps, itineraries and advice to help you plan your route. 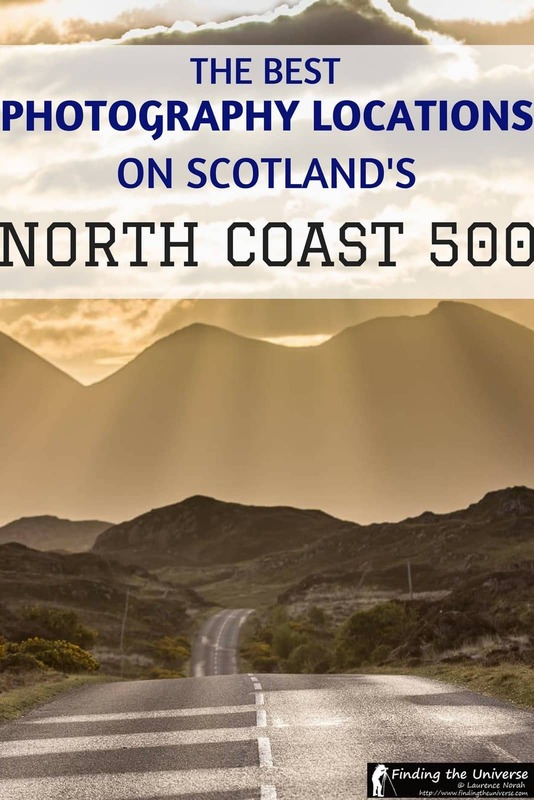 The official Rough Guide to the North Coast 500, which is packed full of information about the route. We can also recommend the Rick Steves Scotland book for Scotland in general. We have put together two lists on Amazon which contain many useful items you might want to pack for a North Coast 500 trip. You can see those on Amazon UK here, and Amazon US here. Finally, if you like the photos we took in this post and are interested in improving your photography, take a look at my online travel photography course, which has everything you need to know to start taking awesome travel photos, from picking a camera, to mastering the settings, to editing – and more! And that sums up my guide to some of the best photography locations on Scotland’s epic North Coast 500! Have you driven this road? Got any photography locations you love? Let us know in the comments below! So you know: our North Coast 500 trip was in partnership with the North Coast 500, who covered our accommodation and the majority of our meals and attraction entry. We covered our own transport costs and additional expenses. All opinions are our own, and you can always check our code of ethics to see how we choose who to work with! The Loony Dook 2020: Everything You Need To Know! Having completed the NC500 last Autumn but in the opposite direction to yourself it brought back some great memories for me. 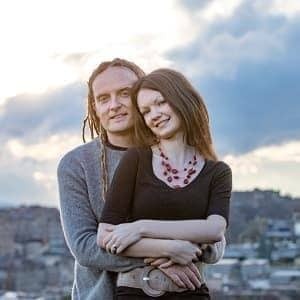 You have some great photos and advice in here but if there is one extra I could suggest it would be to look for opprtunities to detour off the main route. After 3 attempts I finally made it to Cape Wrath in wonderful weather. How lucky was that. 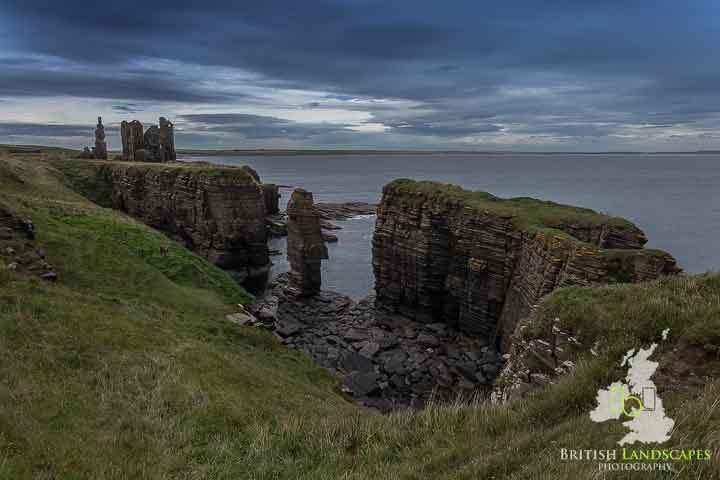 Knowing the North of Scotland well from many earlier trips I already knew some of those opportunities ( incl the one here of Sinclair and Girnigoe Castles ) and others can be found in my three part blog by following the link below. Hi Derek! Thanks for the input – your suggestion is excellent 🙂 And thanks for sharing your post to help others, appreciated! No problem Laurence. Pleased with of your appreciation. Thanks. Doing this route in September. Thanks for the great location tips and the lovely images. Your photography convinced me. We’ll have to return to Scotland to see these places!